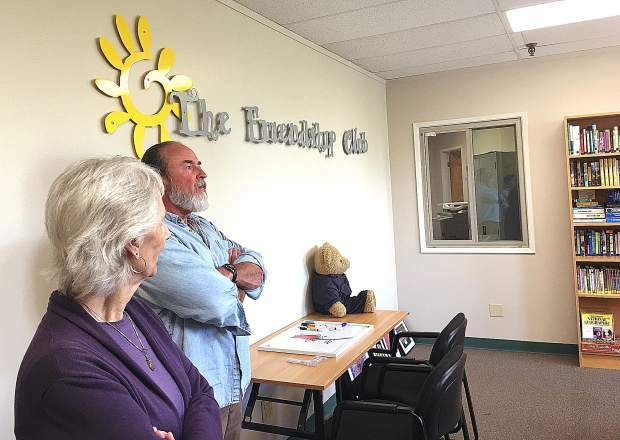 Joe Fish and Beth Cullen tour the new location of The Friendship Club. The two are business neighbors within the building, constructed in the 1930s. The Friendship Club has found a new place to call home. The group, founded in 1995, is a year-round program that serves at-risk girls in sixth to 12th grade. The club holds nonprofit status and serves 85-100 girls from all areas of western Nevada County. The Friendship Club leapt at the chance to re-locate to a larger space and the club was supported in their first-phase expansion by an anonymous gift. For Executive Director Jennifer Singer, the relocation to the Litton building holds special significance. Singer’s father, Charlie Litton, and his family once called the building home. Singer explained that the building – constructed in the early 1930s – was originally intended to serve as a community hospital. Plans for the medical center were scrapped and the building sat vacant until Singer’s grandfather, Charles Litton Sr., purchased it to house his engineering firm. With time the top floor of the building was constructed as a residence, where the Littons celebrated holidays, welcomed guests, and threw parties. The new location offers the club much more space to interact with and guide the participating girls. A large outdoor space is being tended in anticipation of a vegetable garden, picnic areas and outdoor activity space. The club offers its participants everything from homework help to peer counseling. A meal coordinator plans and cooks healthy and nutritionally sound after-school meals for the girls, some of whom suffer food insecurity at home. Though some of the girls are reluctant to change, Singer said they are enjoying the new location overall. Singer is quick to point out that in the end, no matter where they are located, Friendship Club remains committed to the many girls whose lives have been impacted by the organization.